(Nanowerk Spotlight) In a previous Nanowerk Spotlight we have reported about the work of Chinese scientists who demonstrated that a sheet of carbon nanotube (CNT) thin film could be a practical magnet-free loudspeaker simply by applying an audio frequency current through it (Nanotechnology that will rock you). The team has now reported that their CNT films can also work as an incandescent display, driven by a simple addressing circuit with response times faster than that of liquid crystal displays (LCDs). At the same time, the incandescent light of the CNT film is almost nonpolarized, and will not have the viewing-angle problem of LCDs. "We have found that CNT films in vacuum can be heated to incandescence and cooled down in about 1 millisecond by turning on and shutting off the heating voltage," Peng Liu tells Nanowerk. "We attribute the high response speed to the CNT film's ultrasmall heat capacity per unit area (HCPUA), large surface area, and large radiation coefficient." 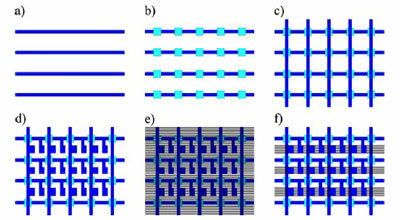 Liu is a member of the team at the Department of Physics & Tsinghua-Foxconn Nanotechnology Research Center at Tsinghua University in Beijing who worked on this research and first author of a recent paper in Advanced Materials where the findings have been reported ("Fast High-Temperature Response of Carbon Nanotube Film and Its Application as an Incandescent Display"). 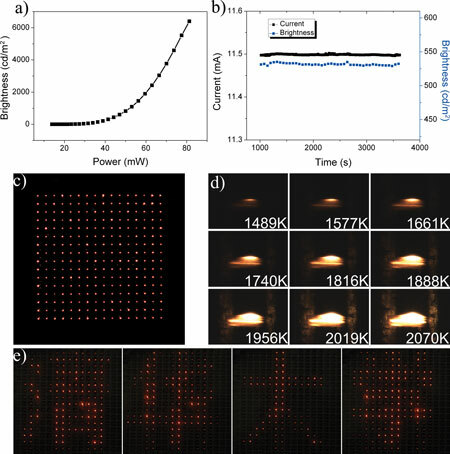 Liu and his collaborators found that a heating voltage puls can make their CNT film glow at a temperature of about 1542 K (1269 °C). Interestingly, the ramp-up and cooling-down times are about 100 times faster than that of traditional materials such as tungsten wire (a tungsten wire with 15µm diameter needs about 100 ms to reach a stable incandescence state when an electric heating signal is applied). "The fast thermal response was the scientific core of this finding" explains Liu. "For traditional materials, because their mass and thermal capacity are large, the variation in temperature is usually slow. In contrast, the thermal response with nanomaterials such as carbon nanotubes can be very fast even up to the incandescent state, thus open up new applications of the traditional phenomena." The ramp-up times (the time from 90% of the maximum of the heating voltage to 90% of the maximum of the photodiode signal) and cooling-down times (the time from turning off the heating voltage to a value of the photodiode signal that is slightly larger than its minimum) for the CNT films are about 0.8 ms and 0.7 ms, respectively. "The fast temperature ramp-up rate of CNT films can be attributed to their ultrasmall HCPUA," says Liu. "The fast cooling-down rate of the CNT film should be attributed to their large surface area and large emissivity because of their large absorbance, according to Kirchhoff's law. The consistency between the simulated and experimental results shows that the thermal physical parameters we selected for CNT film are plausible." As a demonstration of their CNT display, the team has fabricated a 16 pixel x 16 pixel CNT film array using screen printing, laser cutting, and pipe-free vacuum-sealing technologies. This incandescent CNT film matrix can dynamically display Chinese characters. The power consumption in the all-on state of 16x16 array is only 1W. Liu points out that, although presently their CNT incandescent display is only single color, it would be possible to realize a color display in a mode such as a thermionic emission display after a further coating of low-work-function materials. "Compared with the fabrication of LED displays, the fabrication process of a CNT incandescent display is simple, consumes less energy, and is less polluting," he says. "We hope that the CNT film array can also be used in other fields, such as fast-temperature-variation loaders or sensors."